Wine of Madeira, Portugal. 15 years old. Medium rich. Matured in American oak casks. Family owned winery.This Madeira wine has been crafted from the volcanic, sub-tropical Portuguese island of Madeira, located some 400 miles off the Northwest African coast. 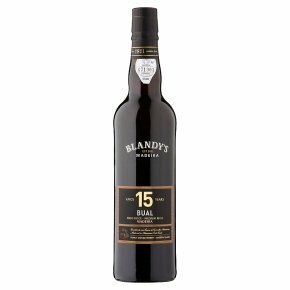 The Blandy's are unique in being the only family of all the original founders of the Madeira wine trade to still own and manage their wine company, maintaining a tradition that goes back to 1811. Bual is grown almost exclusively in the Southern regions of Calheta and Ribeira Brava and produces a medium-rich style of wine. Matured at the Blandy's Wine Lodges in the centre of Funchal, this Bual has notes of figs, walnuts, orange peel and spices with layers of complexity and a long finish. Best served as an after dinner drink.